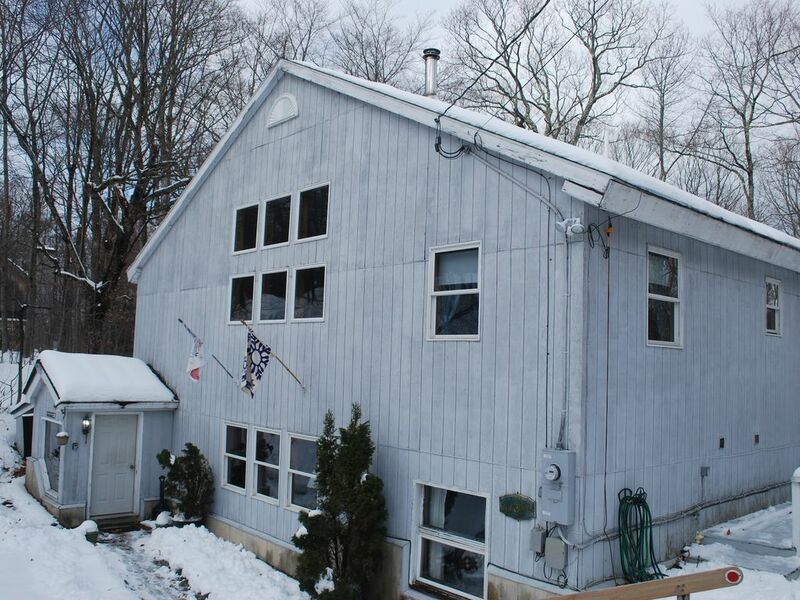 Our custom built home is located in Killington on an acre of land, on a paved town road with other vacation homes. A second story has been added to make it bigger and even better. Please go to "View all rental rates" for the correct rates.This past week (November, 2018) the entire house has been repainted inside, and all the carpeting has been replaced. It looks really great! Our house has a large kitchen-dining area on the first floor with a 24' cathedral ceiling, along with 3 BRs, 1 &1/2 baths, an indoor sauna, and a shower room for two and a Vermont Castings wood stove. A 'sun burst' pattern of antique skis & bamboo poles is displayed on one wall, with more antique skis and snowshoes displayed on other walls. The second floor has a bedroom, full bath, a living area which extends the length of the house (40') and includes a sleeping alcove with a Murphy (double) bed. There are two other sofas, several chairs & a recliner as well. The living area affords a winter view of the Green Mountains beyond the trees. A sliding glass door exits onto a large deck (with a new and larger hot tub), which descends to another deck facing the woods that has a dining table for eight. The living area extends 17' into the house to a balcony overlooking the dining area. IMPORTANT: There are usually multiple inquiries for the same times. If the days are open, I click "accept", but the reservation is not confirmed until the deposit is made. That means it's on a first come first served basis. To keep our rates down, the rental does not include sheets, pillow cases or towels. Blankets and pillows are provided. Bed linens and towels can be included in the rental for an additional $15 per person. We do not accept Saturday arrivals or departures, as they would break up weekend rentals. I am a retired teacher, and my wife is a retired nurse/Lamaze instructor. We live in a small village in Rockland County, New York. We are both very active in our community, and continue to work part time. We bought the land in 1968, and built our house in 1979, adding a second story in 2004 to accommodate our growing family. We have three grown children and seven grandchildren, and our Vermont home acts as a gathering point several times a year when we all get together to ski and relax. We have many repeat renters who love our Killington home, and return year after year. They enjoy the amenities that our house has to offer, and its location- private, yet just a few minutes from the slopes and Killington's night life. What sets our Killington home apart from most others is the incredible spaciousness of the living areas. The house is a five minute drive from the most popular lift areas, restaurants and night spots at Killington. Summers are wonderful at Killington. Hike the Long Trail, take the lift up to the top of Killington with your mountain bike and ride the trails down, golf, swim, or sit on the deck of the Foundry restaurant, drink your cocktail, and watch the sun set. If you're really feeling lazy, just sit on our deck, and listen to the breeze stir the leaves in the trees. In the evening, light a fire in the chiminea on the deck, and sit back and watch the flames, or look up and count shooting stars.